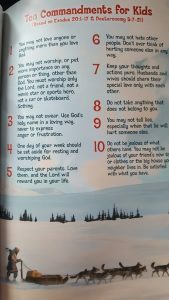 The Adventure Bible: Polar Exploration Edition is a fantastic Bible for any kid! They’ll love it and enjoy their journey with Christ! Getting a new Bible, both as a child and an adult, has always been fun for me. I love flipping through and learning new things or being reminded of things I already new in the little ‘extra’ sections. It’s always fun to read what they found pertinent and re-reading those stories from a new light! The Adventure Bible: Polar Exploration Edition is super fun all on it’s own. 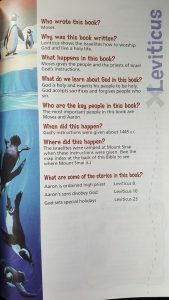 Throughout the Book, they have inserted images of what we imagine the polar landscape to be with each book of the Bible. Each one telling who wrote the book, why and when it was written, who it was written for as well as some of the key teachings of that particular book. There are narration spots with penguins in ‘Did You Know?’ sections. These sections answer questions such as ‘Why do we give?’, ‘Why was Habakkuk so unhappy?’ (Habaukkuk 1-2), and ‘What is the “Word”?’ (John 1:1). I love that they took out these sections and inserted answers to questions many of us have or have had at some point. 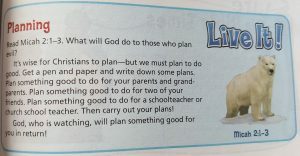 What a great way to feed the soul of Christian children! 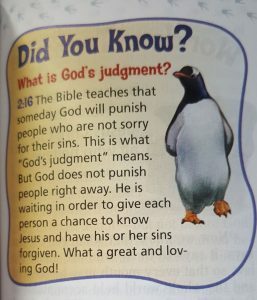 Another part they did has various polar animals provide ‘Live It’ sections that depict how to live out particular Biblical applications such as ‘Look in the Mirror’ based upon Matthew 7:1-5 that tell us what Jesus says about judgment or ‘What You Heard’ going further into 2 Timothy 1:13-14. These sections make it so much easier to decipher what the scripture is teaching us. 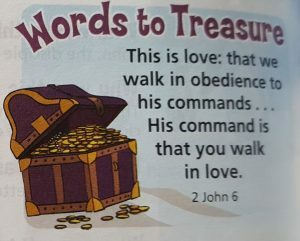 Words to Treasure are sprinkled throughout the entire Bible, featuring various scripture and pictured with a treasure chest. One of my favorites: “Now these three remain: faith, hope and love. But the greatest of these is love.” 1 Corinthians 13:13 is included in the Words to Treasure section. This section includes an adorable picture and a small paragraph explaining whatever the section is about. An example is depicted on the Page with Psalms 38:39 of an archer in clothing we imagine would have been worn at the time, holding a bow getting ready to fire. It tells us that Psalm 38 pictures God as an archer, His arrows wound a person who does wrong but only to help us as when we feel bad about doing wrong, w will confess so that God can forgive and heal us. I love this explanation, as it’s difficult for some to wrap their minds around such concepts. 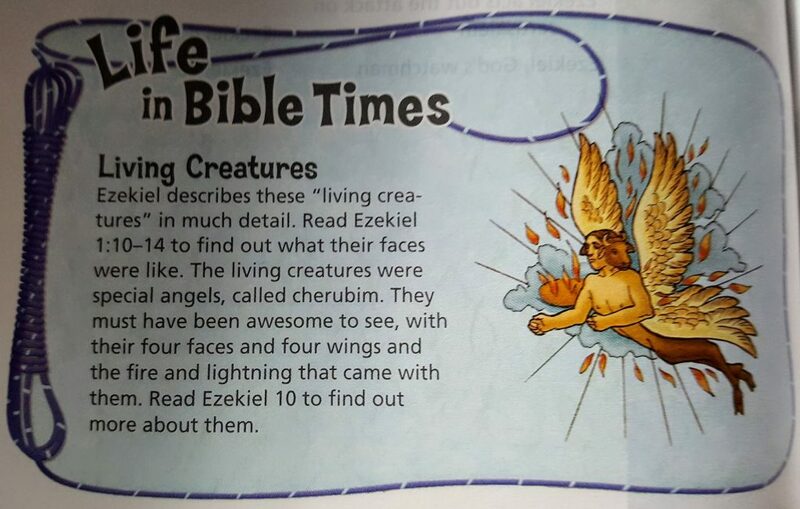 People in Bible Times is another little snippet throughout. Each of these point out a person who is being spoken of in the scripture and gives a simple explanation of who they were, what they did, etc. 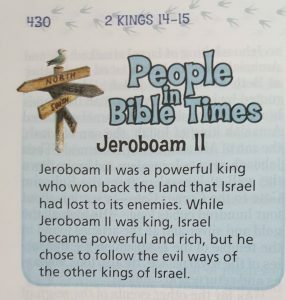 Definitely a great way to help kids get inspired to read more about or have a deeper understanding of those God chose to be featured in the scripture! There are also thicker pages throughout that include sections to deepen our learning and understanding. Such as ‘Famous Children of the Bible’ a ‘Love Passage for Kids’, ‘Two Week Reading Plan’, ‘How to Pray’, a timeline of Jesus’ life, ‘The Lord’s Prayer’, ‘Bible Verses to Read When You Feel….’, and so many more. Each of the sections include cartoon like depictions of the arctic related often to what it’s teaching. Obviously, I’ve enjoyed the Bible a lot and I’m having issues deciding which of the children in my life would find the best use in it. There’s also a temptation to study it on my own for a while, as I love learning and being reminded of different facts myself! The Bible is a New International Version which is quite common these days. My wish is that they’d do the same thing with King James Version as NIV has taken out and modified many things. I get that it’s meant to make it easier to read and understand as it seems that’s more difficult for people today, though I don’t remember it being particularly difficult 30 years ago. It just takes more study, and in my opinion that is a good thing. But alas, NIV is a great way to get an understanding where one may be struggling in KJV. My NIV Bibles are for reference only. I consider them to be the ‘Cliff’s Notes’ of the Bible world.